It’s been cold here, below freezing for days, and below zero at night. We in Washington have no reason to whine–after all, this is not West Yellowstone or Minnesota or northern Alaska. But we don’t get much of this weather, and aren’t used to it. The cold makes everything a little more challenging. I pulled on layers of clothes this afternoon, and put on my warmest boots. I drove west and stopped at the end of the plowed part of the road. Sun was bright up on top of the mountains, leaving the valley bottoms in shadow. Walking kept me warm enough, except for the part of my ears that my hat didn’t cover. No one else was out, so I was happy to have the woods to myself. The animals conserve their energy. I heard a Douglas squirrel, but the tirade didn’t last long. I observed tracks of snowshoe hare, squirrel, coyote, and some small rodents. I don’t know their tracks well enough to tell which ones they were. Thetis Creek is freezing. Ice is so interesting! 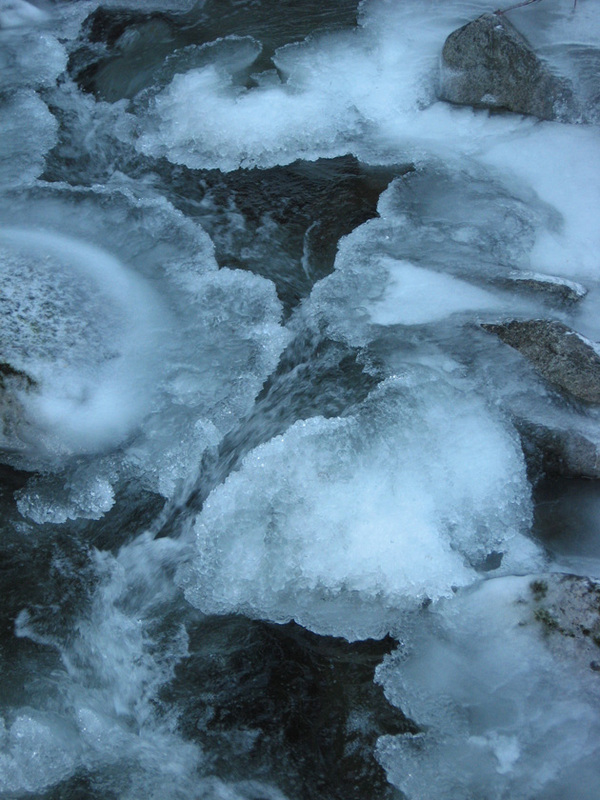 How it forms on moving water depends on how cold it gets and for how long. Of course, this will all change. Slightly warmer weather is supposed to be on the way, along with the possibility of snow. In the meantime, I enjoy the clear days and all the light. And the starshine at night is magical.